The Kittel’s came down from Murfreesboro for the day. They joined us at church then we have a awesome Easter feast. Then Cheryl decorated the bump board for us and we took some photos. When we found out we were pregnant, I wanted to wait to tell family in person. We had a trip to Michigan planned already to celebrate February birthdays and Wes’ parents 30th wedding anniversary. On our way, we were going to be stopping at my parents house to drop Simba off for the weekend. I wanted to tell them in a unique way and I knew it was going to be completely unexpected since we had just moved and everything. To tell my parents, I made them this sign. We walked in and I was so excited to tell them, I was about to burst. It was about 9pm and we were going to be flying out in the morning so I knew this was the only time I could tell them both together before we left. I had wrapped the sign and gave it to my mom as we were sitting down in the living room to chat a little. I told her it was a ‘thank you’ for taking care of Simba while we were gone to keep it a surprise and not have her questions, “why are you giving me a random present?” When she opened it, my dad just looked at it and my mom looked from the sign to me back to the sign. Finally, I couldn’t hold it in any longer and said “I’m pregnant!” They were both so excited, jumped up and hugged us. Mom told me later that she was wondering if it was true or if it was because we already call her Nana to Simba. She didn’t know if I meant a grand baby or just referring to her grand dog! I made a sign for Wes’ parents as well, but instead of it being the same thing, we came up with another saying. 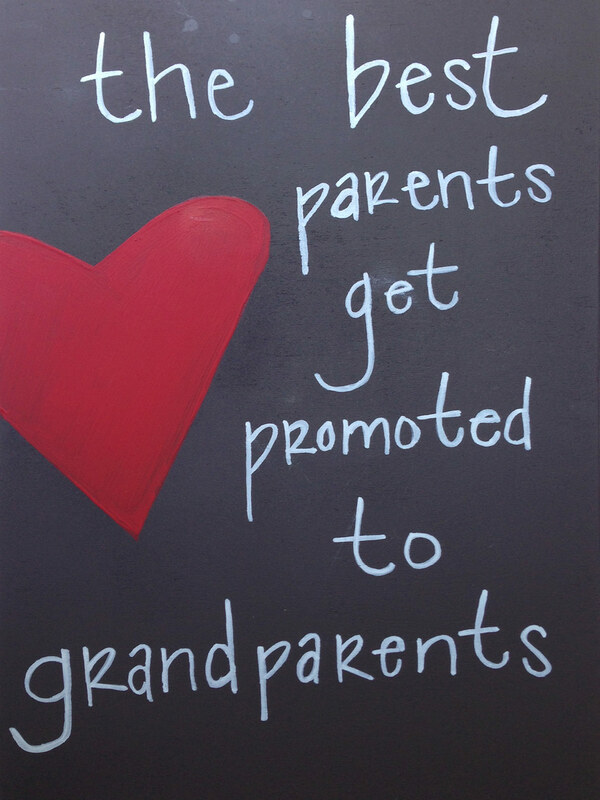 Wes felt that because we have a niece and another one on the way, they were already promoted. We then flew out to the next morning to go visit Wes’ family. His parents picked us up from the Chicago airport which meant a 3 hour drive home. I had already talked to Wes and asked when he wanted to tell them. He wanted to wait until we were home so that meant trying to talk for over 3 hours (stopped for food) without even mention or hinting about this massive news bursting inside us! Somehow we made it and when we got home and everything into the house, Linda started cooking and Terry was relaxing. I brought the present in and we told them it was an early anniversary gift. Linda I think knew right away by the way she looked at me but she didn’t say anything. 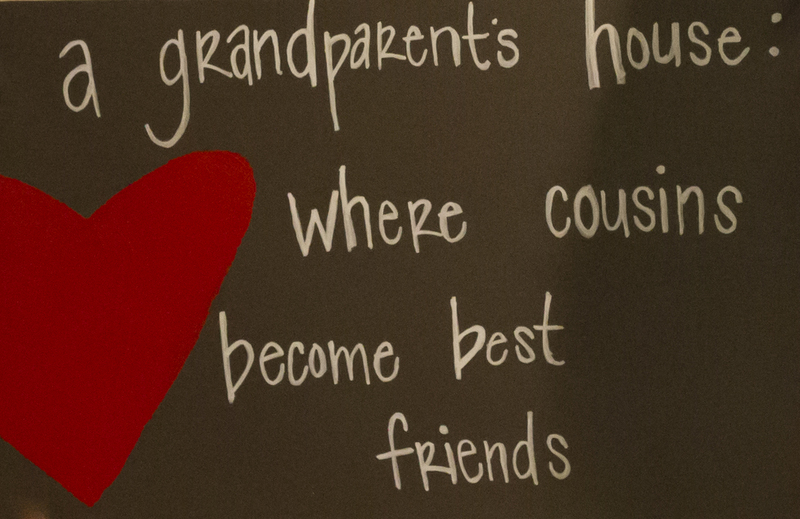 Terry opened the present and one of the first words on the sign that appeared was cousins. Linda, already suspecting, knew right away, looked at me a smiled. Terry finished unwrapping it and just read it not getting it yet. Finally Wes had to say “the key word is cousins… for there to be cousins that would mean…” Finally it clicked and they both gave me a hug and were very excited as well!